Last night, the Beach Boys’ Brian Wilson was honored at a tribute concert held at the Fonda Theatre in Hollywood. 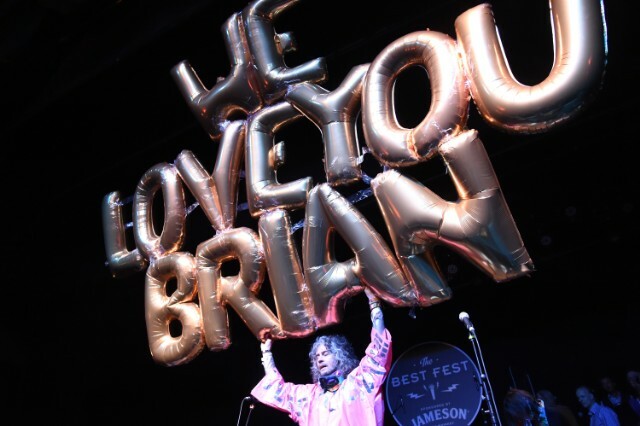 Brian Fest aligns with the release of Wilson’s forthcoming 11th solo album, No Pier Pressure, which is due out early next month. An all-star cast of performers included Wayne Coyne and Steve Drozd of the Flaming Lips, Norah Jones, Kesha, Devendra Banhart, M. Ward, Boz Scaggs, Bethany Consentino, Local Natives, Doyle Brahall II, Al Jardine, Wilson Phillis, Karen Elson, Joy Williams, Jade Castrinos, Adam Busch, Danny Masterson, Gingger Shankar, Sebu Simonian of Capital Cities, Carnie Wilson and Wendy Wilson of Wilson-Phillips (Brian’s daughters), and Ann Wilson of Heart (no relation). Brian Wilson himself performed as well, taking the stage to sing some of the Beach Boys’ greatest hits “Fun Fun Fun,” “Surfin’ U.S.A.,” and “Barbara Ann.” Watch videos of the Flaming Lips, Brian Wilson, Kesha, Bethany Constentino, and Norah Jones covering some of Brian Wilson’s greatest compositions at the concert below.